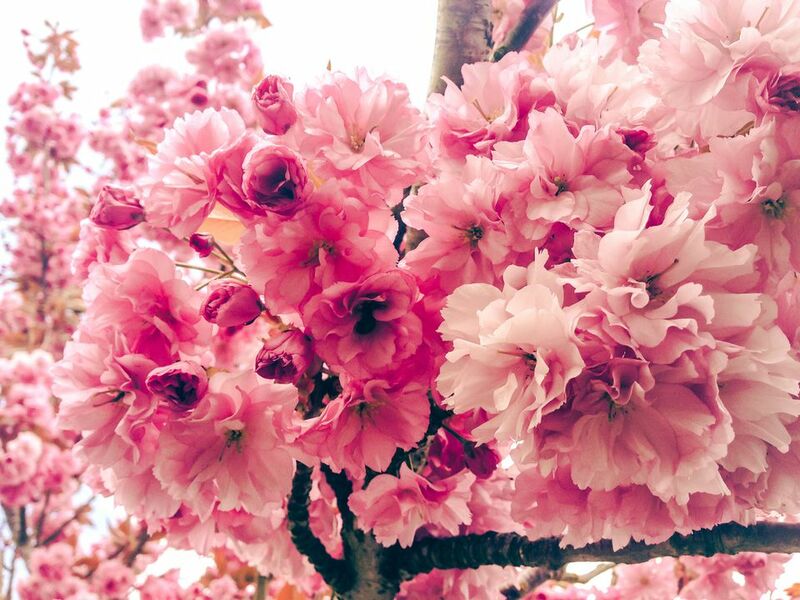 Japanese Flowering Cherry Trees are known by the names 'Kwanzan,' Kanzan, and 'Sekiyama,' but no matter what you call them, one thing doesn't change: the trees' gorgeous pinkish-red blossoms that bloom during the spring months. Prunus serrulata 'Kanzan' is one of the two stars of Washington, D.C.'s, Cherry Blossom Festival. (The Yoshino Cherry Tree, or Prunus x yedoensis, is the most common tree in D.C., but P. serrulata 'Kanzan' comes in second.) This species doesn't produce any fruit, which is a plus for those who desire low-maintenance landscaping. It's also deer-resistant. When choosing between the various types of medium-sized ornamental cherry trees, P. Serrulata 'Kanzan' is a good choice if you want an upright, vase-shaped growth habit. If you want a weeping form, select weeping Higan. If your tastes lie somewhere in-between, the popular Yoshino may be right for you. Grow Kanzan Cherry Trees in full sun and in well-drained soil with plenty of humus. Keep the soil evenly moist, because this is not a drought-tolerant tree. Kwanzan cherry trees can function in the landscape as fast-growing shade trees for small spaces, such as patios. While these type of cherry trees grow to be moderately large, it's possible to grow Kanzan cherry trees as bonsais. Keep in mind that P. serrulata 'Kanzan' can be fairly short-lived—between 15 and 25 years—because it's particularly susceptible to pests and disease. Kanzan Cherry Trees grow best in full sun, which means it needs at least six hours of direct, unfiltered sunlight each day. This will produce optimal blossoming. However, the tree can tolerate part-shade. This cultivar of Cherry Tree isn't particular about the type of soil in which it grows. It can grow well in acidic or alkaline soils that loamy, sandy, or clay. The tree prefers moist conditions but is somewhat drought-tolerate once established. Add a layer of mulch to the top of the soil to keep it moist and insulated, particularly during the winter months. Despite being somewhat drought-tolerant, Kanzans prefer plenty of moisture, preferably through regular irrigation. Once established, Japanese Flowering Cherry Trees can tolerate both heat and humidity. Fertilize Kanzan Cherry Trees once a year in the spring with a fertilizer that's specifically developed to be used with cherry trees. You can propagate Japanese Flowering Cherry Trees through seeds or from cuttings, though the latter is likely the easiest method. Take a semi-hardwood cutting from the tree during the summer months, choosing a branch that has two to four leaf nodes and leaves. Cut off a 4- to 8-inch section at a horizontal angle and remove the leaves from the bottom two-thirds of the branch. Dip the cutting into rooting hormone. Push the cut end into a mix of soil made of half perlite an half sphagnum peat moss. Pat down the soil around it. Place a plastic bag over the container, and move the pot to a sunny location. Mist the cutting twice a day to keep the soil moist. After two to three months, gently tug on the cutting to see if it's rooted. If there's resistance, let the cutting grow until the roots have filled the pot. When ready, transfer the plant to a gallon-sized container filled with potting soil and move it outside to let it acclimate to temperatures for a week before transplanting the tree to a location with full sun. Generally speaking, very little pruning is necessary for Prunus 'Kanzan.' If you need to prune, do so after the tree flowers. Sometimes, the limbs can grow too quickly and heavy for the base. Prune away the heavy branches as needed. Peachtree borers are a pest problem for these (and other) cherry trees. In fact, their susceptibility to a number of pests earns them the dreaded "short-lived trees" label. For borer control, most experts simply advise keeping the tree vigorous (and therefore less susceptible to borer attack) by providing adequate irrigation and fertilizer. To fertilize organically, back-fill with some compost when planting and top-dress periodically thereafter, watering the nutrients into the soil. Other small pests that trouble this tree are scale insects, spider mites, and aphids. You can generally blast these pests off the leaves with a strong spray from your garden hose. Tent caterpillars will eat the leaves, so remove their silky nests as soon as you spot them before much damage can be done. A more significant problem is bark-splitting, whereby large cracks emerge in the trunk. Cornell University's Plant Disease Diagnostic Clinic notes that such a crack can allow disease organisms to enter and subsequently cause decay. As a solution, the clinic recommends tracing with a knife just outside the split in the trunk, and then remove the bark from inside the traced area. This will prevent the crack from expanding and, if the tree is otherwise healthy, the area should callous over, preventing the incursion of disease organisms.